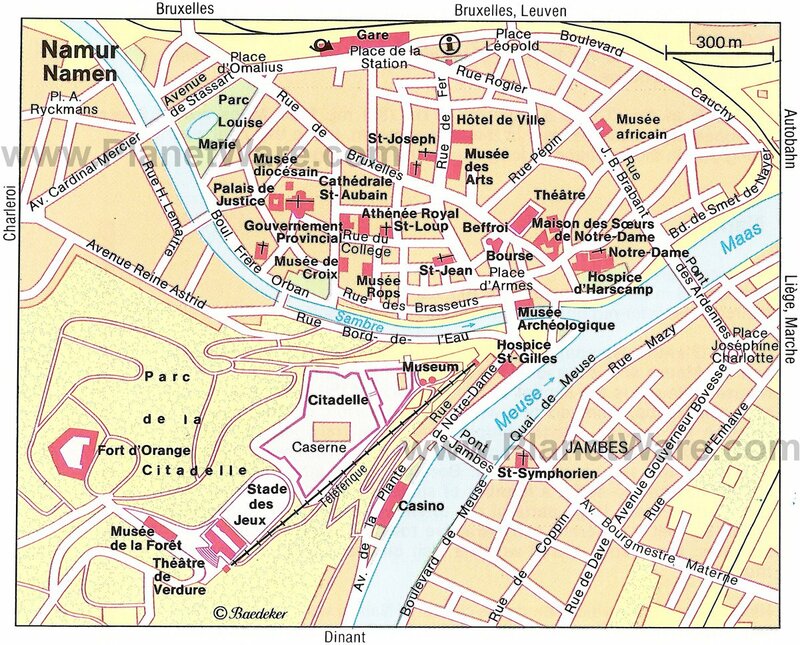 Namur (in Flemish Namen), at the confluence of the Sambre and the Meuse Rivers, is an important university town, but it was once a critical junction for both road and shipping transport. The hill on which the citadel sits was already of great military importance by Roman times and today, it's one of the town's most important attractions. 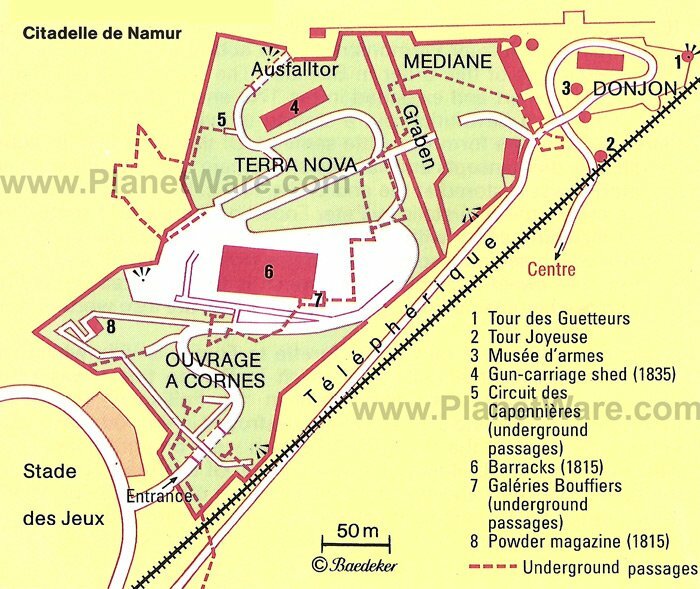 Namur's strategic position led to a number of sieges throughout its history. Due to these battles, the city has an interesting hodgepodge of architecture from different time periods. Namur also makes an excellent base for visiting the pretty villages of the Meuse and Semois Valleys. Namur's impressive citadel, sitting above the town, is one of the mightiest fortresses of Europe. As early as Roman times, the rocky outcrop between the Sambre and the Meuse was fortified, so it's no surprise that the Counts of Namur chose this as the site for their castle. It's a great place to explore with barracks, ramparts, and subterranean tunnels. The best views across town are from the citadel's bridge below the barracks area. From here, you can look down onto the bend of the Route Merveilleuse around the "donjon" (the site of the medieval castle). Rue de Fer, in the central city, has two excellent attractions. The fine patrician residence, the Hôtel de Gaiffier d'Hestroy, dating from the 17th century contains the Museum of Ancient Art (Musée des Arts Anciens du Namurois), which exhibits artistic artefacts of the Middle Ages and the Renaissance from the Namur region. In particular, the exhibits of local goldsmiths' work, ivory pieces, and copper utensils are of exceptional quality. Further along the road is the Baroque Church of Saint-Loup, architecturally the most interesting church in Namur because of its stucco facade with 12 Doric pillars. Peter Huyssens designed the plans for the church, which was built between 1621 and 1645. The Cathedral of Saint Aubain rises up in the middle of Place Saint Aubain. This stately classical domed building dates from 1751-1767 and was built by Gaetano Pizzoni from Milan on the site of a previous 11th-century church. Just to the right is the Diocesan Museum with the cathedral Treasury. On display are liturgical vessels, vestments, sculpture, and goldsmiths' work. Of special note are a 12th-century portable altar of the Counts of Namur with ivory decoration; an eighth-century Merovingian reliquary from Andenne; and the reliquary crown of Philip the Noble of Namur that is said to bear thorns from Christ's passion crown; it was a gift from Philip's brother Henry of Constantinople. The ecclesiastical treasury here contains the treasure from the monastery of Oignies, which came into the possession of the convent in 1818. Its finest pieces were the work of the goldsmith Pater Hugo von Oignies who lived in the monastery during the 13th century. There are two magnificent pieces of particular acclaim that you shouldn't miss: the cover of a gospel of 1230 from Trier decorated with enamel work, and the goblet of Gilles de Walcourt of 1238. The Church of Notre-Dame belonging to the convent lies just to the east of the treasury. This Baroque church, restored between 1750 and 1756, contains the funerary monuments of Counts Wilhelm I and Wilhelm II of Namur in its crypt. To discover the inner city, start your walk at the Pointe de Grognon and visit the former meat hall, which dates from 1590 and now houses Namur's Archaeological Museum. It has a comprehensive collection of antiquities from the Province of Namur dating from the Roman, Frankish, and Merovingian periods (first to seventh centuries) that is regarded as one of the best collections in Belgium. The goldsmiths' work and glass work are valuable and unique. A short way from the museum is the Place d'Armes, the busiest square in town. To the rear, rises the belfry, the foundations of which are a remnant of the Tour Saint-Jacques, which was part of the second city wall in the 14th century. The village of Floreffe is the home of the great former Premonstratensian Abbey, one of the best preserved examples of this order in Belgium. The abbey was founded in 1121 by St. Norbert and extended in the 17th and 18th centuries to its present size. The French Revolution put a stop to monastic life, but it is continued today in the form of a little seminary here. Of the abbey church, only the transepts and sacristy still remain from the initial phase; the interior was restored at the end of the 18th century by Dewez. Of particular interest are the choir stalls by Peter Enderlin. There are 74 seats richly carved, including some with effigies of the founders of the order. 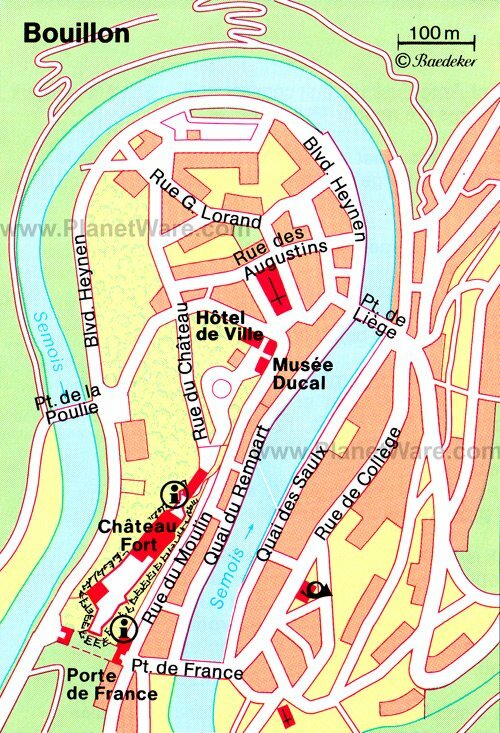 The village of Fosses-la-Ville was originally settled by the Celts, and in Roman times was called "Fossa." The Irish missionary Feuillen (or Follianus) founded a monastery here around 650, which was destroyed in the 10th century. However in the 11th century, when the relics of St. Feuillien were brought here, a start was made with the building of a new church. Of this there remains only the tower, the choir, and the crypt, which is the oldest in Belgium. The remainder of the Church of St. Feuillien was rebuilt in the 18th century. The oak choir stalls (1524) and the 16th-century reliquary of the saints are worth seeing. Near the town of Franc-Waret stands the imposing castle of the same name dating from the 17th century but considerably extended in the 18th century in the style of Louis XV. The buildings are grouped around an inner courtyard reached across a drawbridge. All visitors to the castle are accompanied around the castle's interior on a guided tour where they can view the sumptuously furnished rooms full of beautiful Brussels tapestries, rare porcelain, and Dutch-Flemish paintings. Outside the castle are extensive well-manicured gardens including a French garden, first set out in the 17th century and an 18th-century English garden. Dinant is the second largest town in the Belgian region of Condroz and one of the most important tourist centers in the Ardennes. Thanks to its delightful location in the Upper Meuse Valley below precipitous limestone rocks, crowned by a mighty citadel, Dinant has become a very lively tourist resort, especially at weekends when the Meuse is dotted with pleasure boats and canoeists. In the Place Reine Astrid at the foot of the citadel hill, the collegiate Church of Notre-Dame stands at the end of the Meuse Bridge. It is a beautiful early Gothic building from the 13th century. After visiting the church, stroll up to the citadel above town where you can walk along the battlements with astounding views of the town below. The Château de Spontin is an impressive moated castle and one of the finest in Belgium. It is in the Bocq Valley near the small town of Spontin, 11 kilometers north of Dinant. The château was built on the site of a 12th-century keep, which was extended into a fortified castle in the 14th century and rebuilt in Renaissance style in the 16th century. In 1622, the working quarters were added adjoining the courtyard in which there are beautiful 19th-century wrought-iron fountains. A tour through the castle rooms shows how styles have changed with time. The keep has two bare rooms with Gothic chimneys, the library has a chequered floor, and the salon shows Renaissance styles, while the south wing is typically neo-Gothic. The Semois River rises in the extreme southeast corner of Belgium near Arlon. It flows first through the plain of Gaume in the Belgian part of Lorraine, and at Tintigny, it enters the Ardennes. From here onwards, it has cut a course deep into the hills and forms broad curves around forested rocks, which offer charming views. The steep flanks of the Semois Valley at times approach the river so closely that the roads are often high above the edge, and a trip here is best done on foot or by boat to see the finest parts of the landscape. Many of the larger villages are on the plateau of the Ardennes high above the windings of the river. The major places along the way are Jamoigne, which has an old castle and church; Chiny; and Florenville, which sits on the upper course of the river. Amid the quiet and picturesque forest of the Gaume, right on the French border, lies the most extensive and most beautiful monastery in Belgium, the Trappist abbey of Notre Dame d'Orval. The first monastery in the "golden valley" is said to have been founded in 1070 by Benedictines from Calabria in southern Italy. 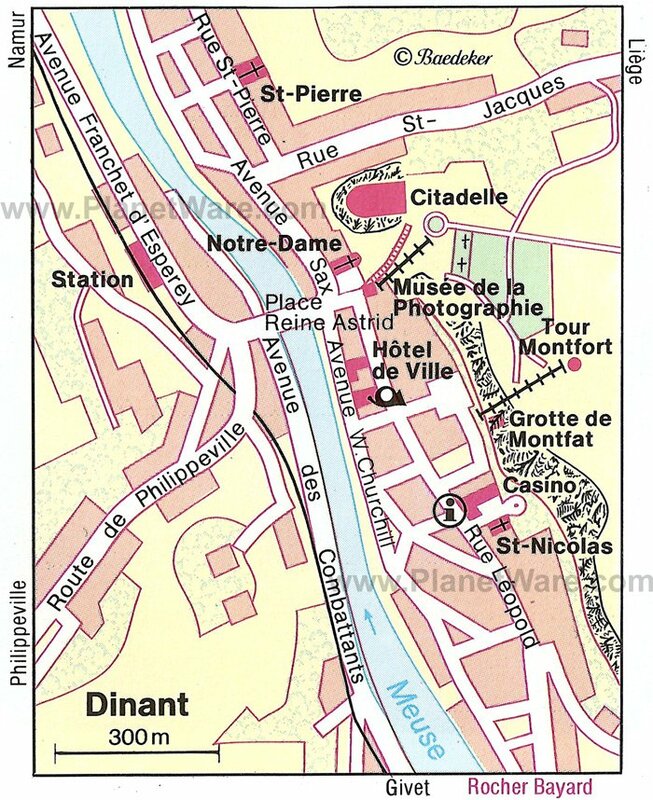 They were followed in 1132 by Cistercians who began building the Church of Notre-Dame. Around 1700 the abbey, which had adopted the strict observance of the Trappist order in 1683, was one of the most prosperous monasteries in Europe. Today, the ruins of the old abbey are highly atmospheric, while the herb garden and old apothecary are also well worth visiting. In the south of the Belgian province of Luxembourg, close to the French border, Bouillon nestles prettily in a loop of the River Semois, encircled by the wooded heights of the southern Ardennes. The Château Fort (Fortified Castle), enthroned on its elevated "island" of rock overlooking the looping Semois on two sides, is a highlight of a visit here. Built by Godfrey the Bearded between 1050 and 1067 on the remains of a still older fortress, the château is the earliest and best preserved example of medieval feudal architecture in Belgium. Also well worth a look in town is the Ducal Museum (Musée Ducal) in a delightful 18th-century townhouse below the north side of the castle square. The section on local history and folklore includes displays of craft work, old furniture, and kitchen fittings as well as memorabilia relating to Bouillon's noble families and the printer Pierre Rousseau. 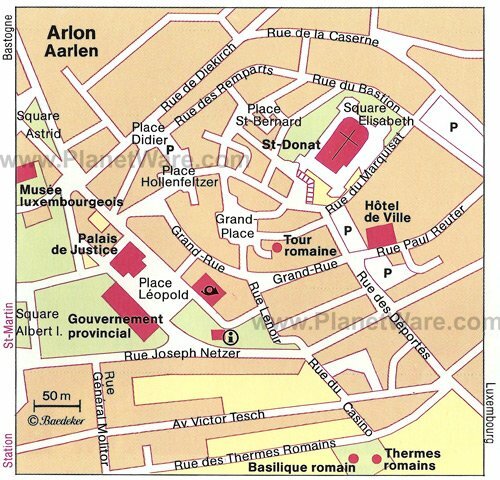 In the far southeast corner of Belgium, wedged between France and Luxembourg, Arlon (in Flemish Aarlen) is one of the country's oldest towns. The Grand Place with its medieval cross (a symbol of civic freedom) is the center of the old town. Reached by an alleyway leading off the southeast corner of the square, the Tour Romaine (Roman tower) is a relic of the third century Roman ring walls and is now a museum. From the Grand' Place, the road climbs to the top of the hill where St.-Donat's church now occupies the site of the counts of Arlon's medieval stronghold. Also worth a look while here is the Musée Luxembourgeois, three rooms of which are taken up by a collection of Roman tombstones and sarcophagi unique in Belgium. The Royal Snail Hotel: luxury design hotel, river views, hip room decor, small glass-sided pool, spa treatments. Les tanneurs de Namur: mid-range pricing, 17th-century buildings, contemporary decor, sauna. Best Western Grand Hotel de Flandre: affordable rates, modern room decor, tea and coffee making facilities. Hotel Ibis Namur Centre: budget hotel, convenient location, family rooms, secure parking.